This adults-only resort offers sophisticated style, lavish personal attention, contemporary, minimalist decoration and uncompromising attention to detail. 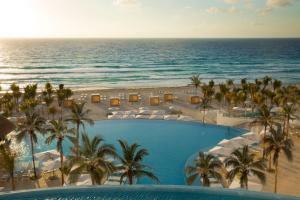 Its luxurious guest rooms tower majestically over one of Mexico's most beautiful stretches of private beach. Guests enjoy the finest haute cuisine at five restaurants, three bars, three outdoor pools, an outdoor Whirlpool tub, a world-class spa and dazzling entertainment. There is a honeymoon desk available and honeymoon amenities include a mini honeymoon cake, bottle of sparkling wine, two keepsake bathrobes, breakfast in bed, nightly petite fours and guaranteed turndown service. Ask about golf packages, wedding packages and unlimited tours. Located just 15 minutes from downtown Cancun and 25 minutes from the airport. Blancintl - International, Mexican cuisine; BlancAsia - Japanese and Thai cuisine; Sports Bar Agregar; snack bars and swim up bars.